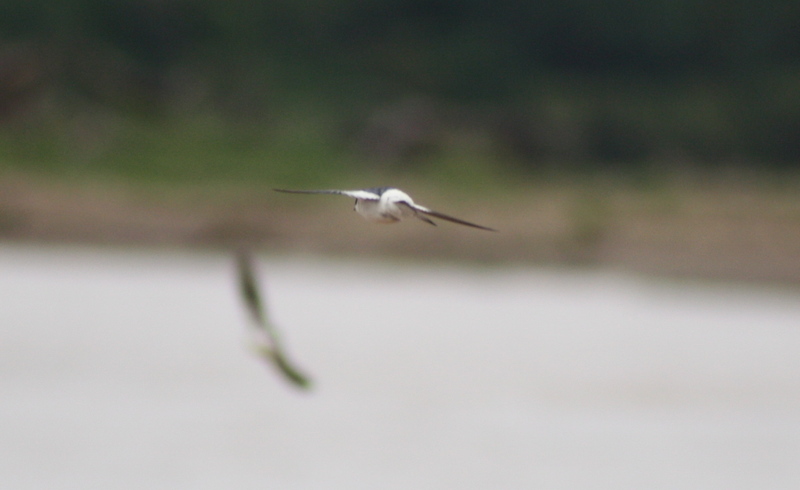 Last week I added some of the photos of birds that I shot while in Chile. 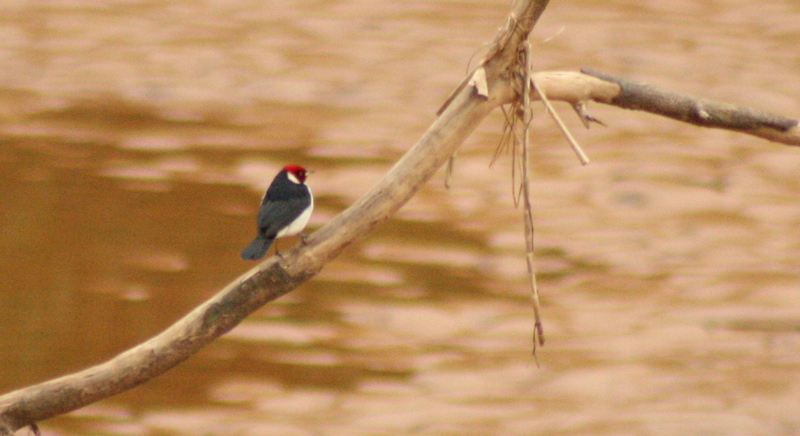 Today, I’d like to share some of my favorite photos of birds from Peru. 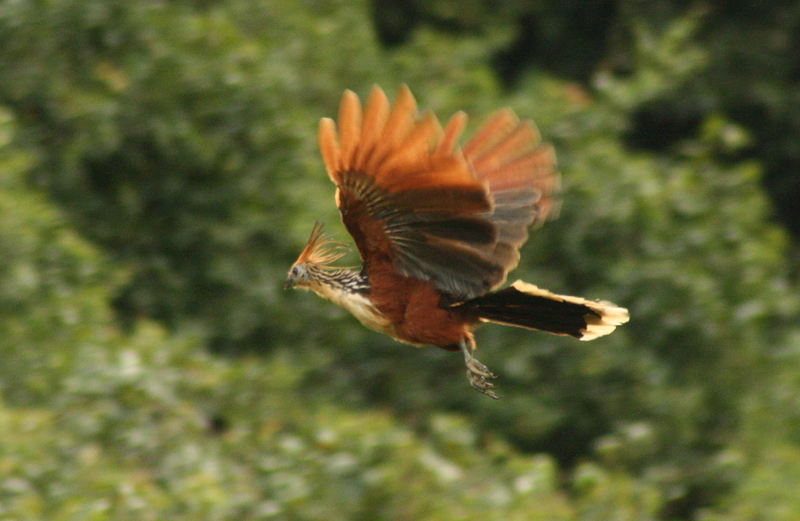 All of these were shot while in and around the Tambopata National Reserve in Madré de Dios, Peru. 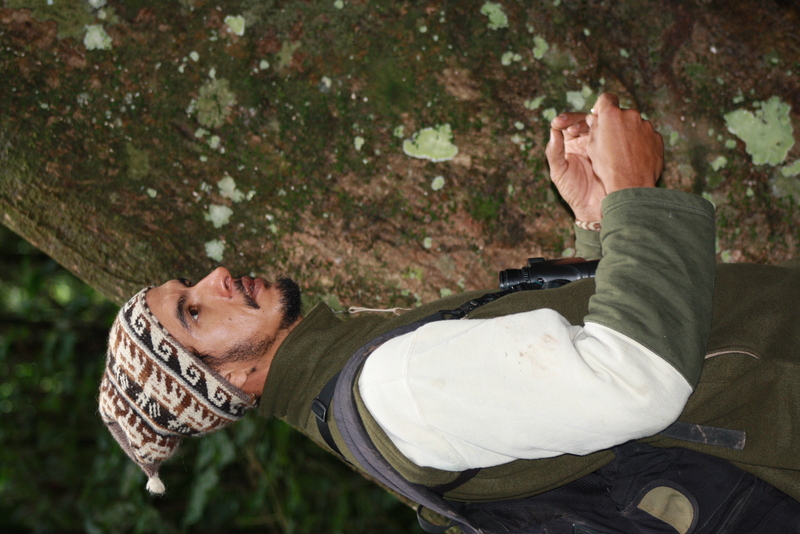 While in Peru, I was able to identify (with the invaluable coaching of my guide, Fino) at least 83 species of birds, of which 72 were new to me. 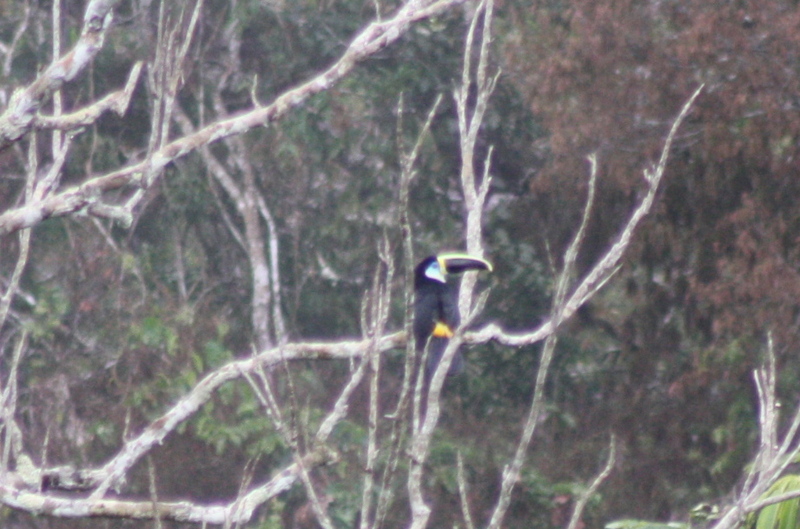 All together in South America, I recorded 105 species, and at least 88 of them were additions to my “life list”. To say that it was a thrill would be an understatement! I hope you enjoy these photos – just click on the photo to make them a little bigger. 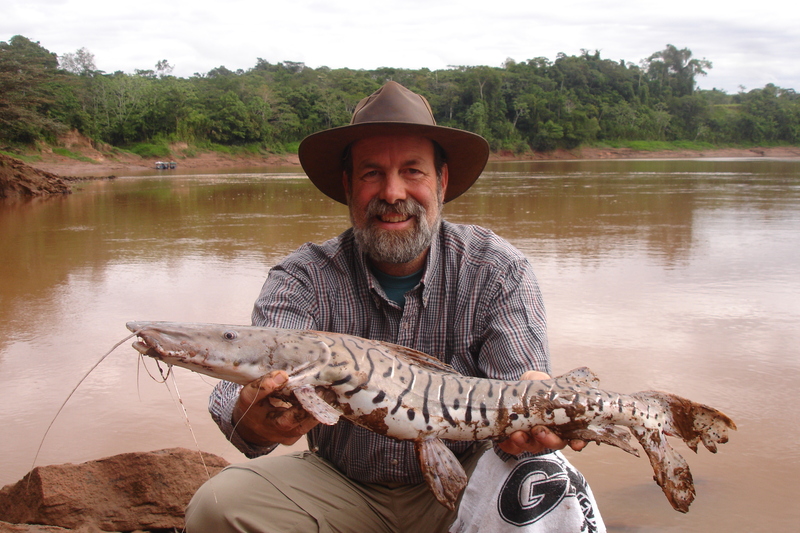 Faithful readers of these pages may remember that not long ago, I managed to catch a fine-looking fish in the Tambopata River in Peru. This one didn't get away! It was a real hoot passing the digital camera around to the various guides and boat drivers connected with the lodge and park in Peru. Clearly, they thought the fish was something wonderful. And because most of them grew up in that area, and many of them live there year round, there was one question that came back more than any other: “What did you do with the fish?” To a man (yes, they were all men), the boatmen were shocked that I would return such a delicacy to the water. The guides, on the other hand, wanted to be certain that I didn’t try to eat the fish. It’s not because the Tiger Catfish/Barred Sorubim is so rare or endangered. 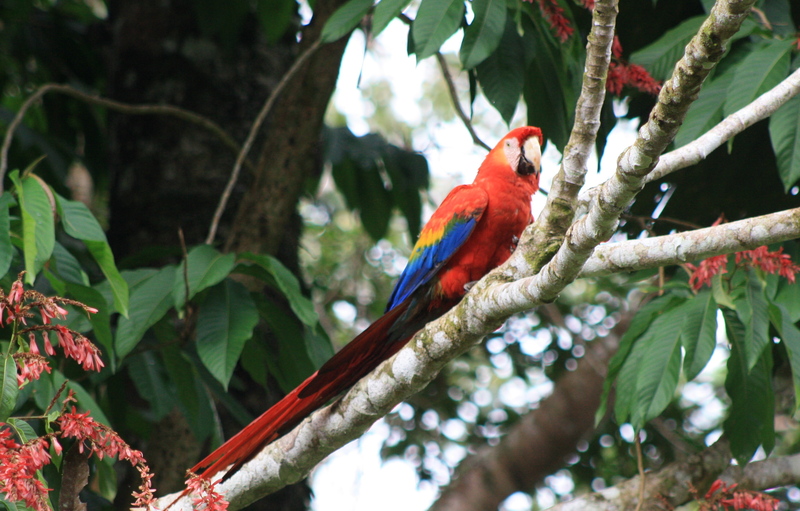 No, there are plenty to be found in Amazonia, and they are said to be delicious. 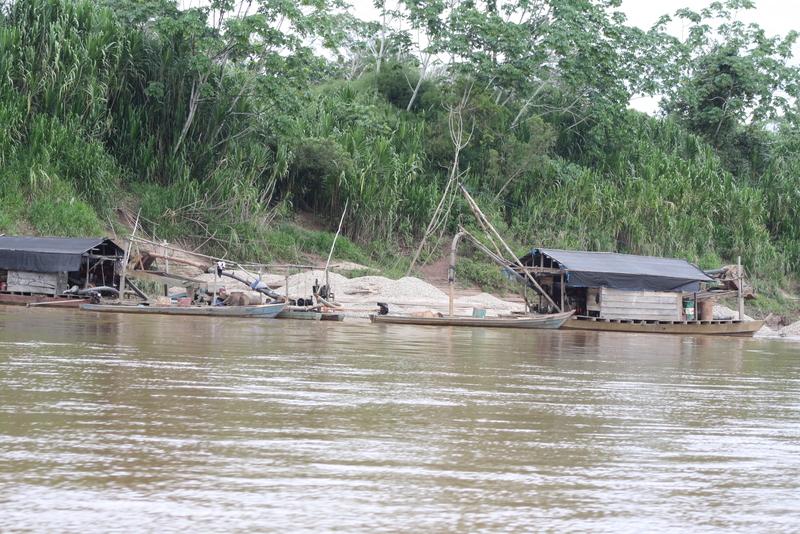 The problem is that at that point, the Tambopata River is full of mercury, a deadly toxin. 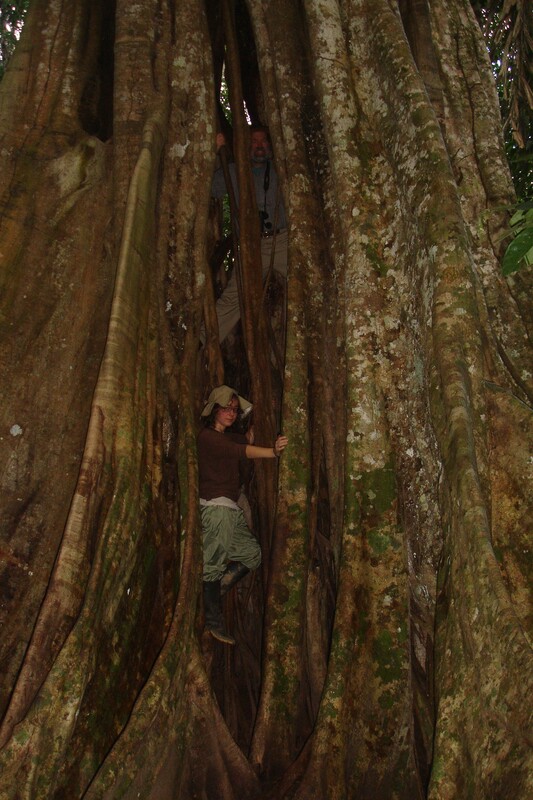 The Tambopata is an amazingly beautiful and rich ecosystem. It supports a wide variety of life, much of which we got to see, and a bit of which is pictured throughout this posting. 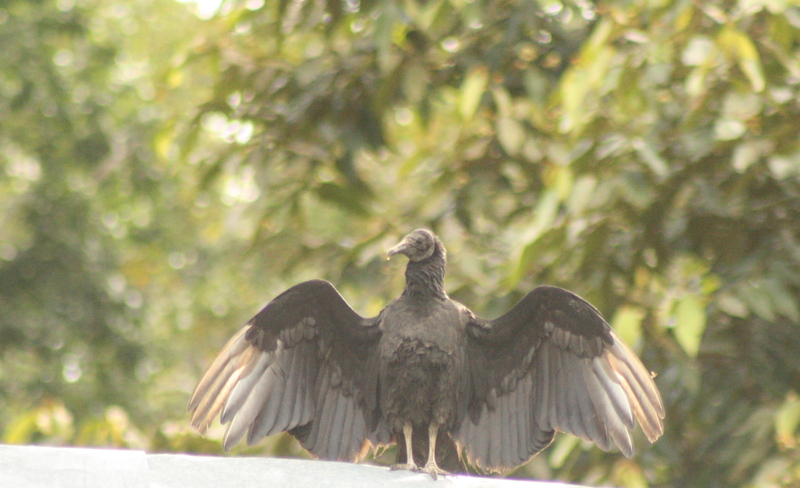 There are mammals and birds and insects – an incredible array of flora and fauna. 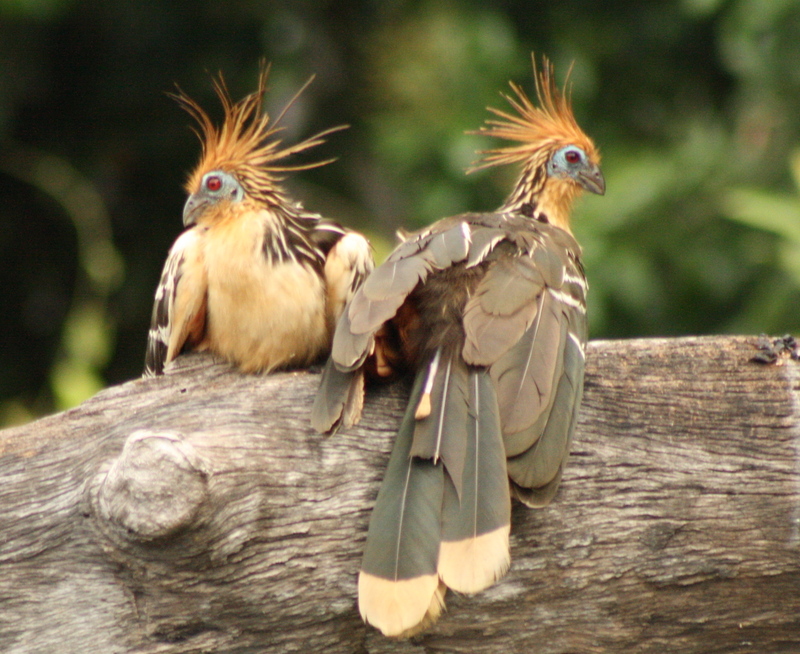 In fact, Peru is the nation with the second-greatest diversity of birds on the planet. Unfortunately for many of those animals, the river system is also rich in gold. Specifically, there are vast quantities of alluvial gold – “gold dust” – to be found in the sand and silt of the riverbeds. In a previous posting I mentioned the color of the river – a chocolatey brown. Part of that is due to natural sedimentation that occurs as rainwater erodes the banks. 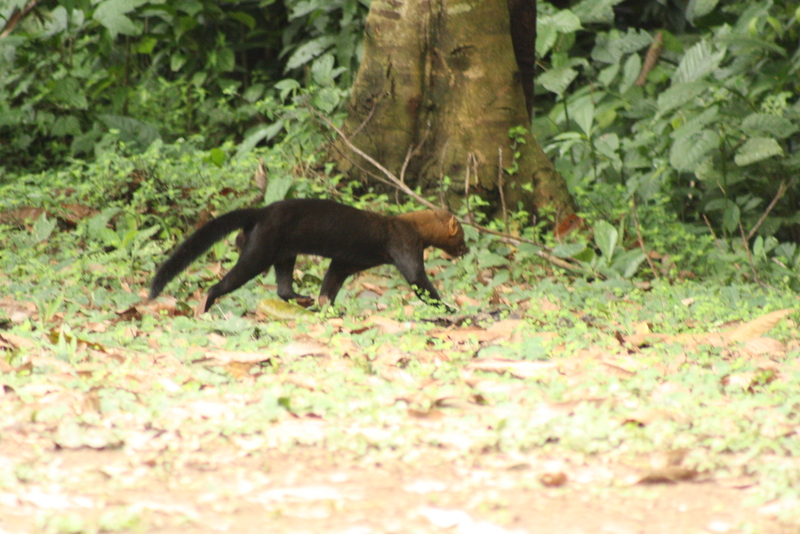 Much of it, especially in the Malinoswki River, (which feeds into the Tambopata) comes from the one- or two-man mining operations that occur with alarming frequency. The miners anchor a small barge/raft over the river bottom and dredge up the silt from the bottom – clouding the water. Then, they pour the silt over a carpet-like filter, and the minerals in the silt adhere to the fibers of the carpet. At the end of the day, the carpet is washed in a 50 gallon drum containing mercury. The gold dust bonds with the mercury, and then is purified into 24 karat gold…while tons of mercury ends up in the river (more than 80,000 pounds of mercury are used in mining operations in the Peruvian state of Madre de Dios each year, with an untold amount ending up in the rivers). To learn more about the ways that alluvial gold is extracted from the rivers,click here. 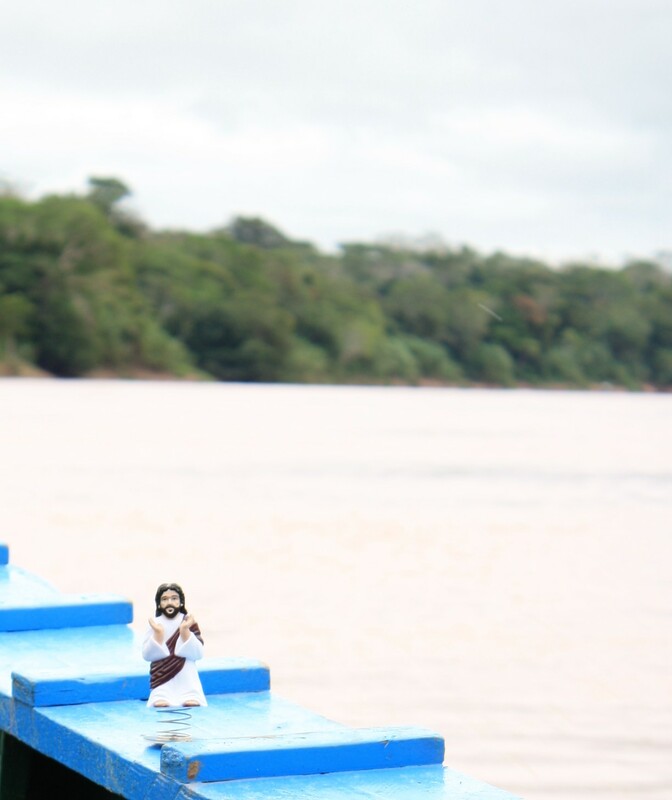 The people who live along these Peruvian rivers use the water for everything: they eat the fish from the rivers, they wash in the water, bathe in it, cook with it, and drink it…mercury and all. While not all of the locals are aware of the adverse effects of mercury in the water, awareness is growing (see this article from PBS that has more information about the dangers of mercury to the local populations). 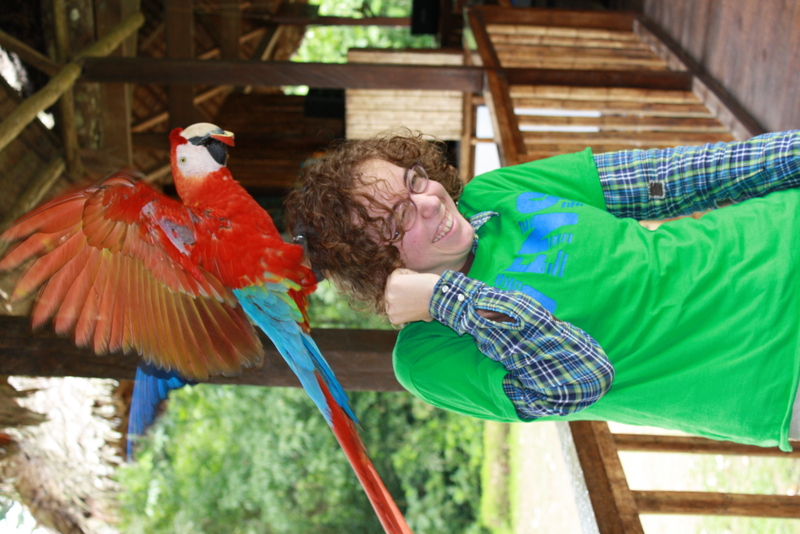 In fact, while staying at the Tambopata Research Center, we met a Stanford student who was working to develop educational materials for the local population. 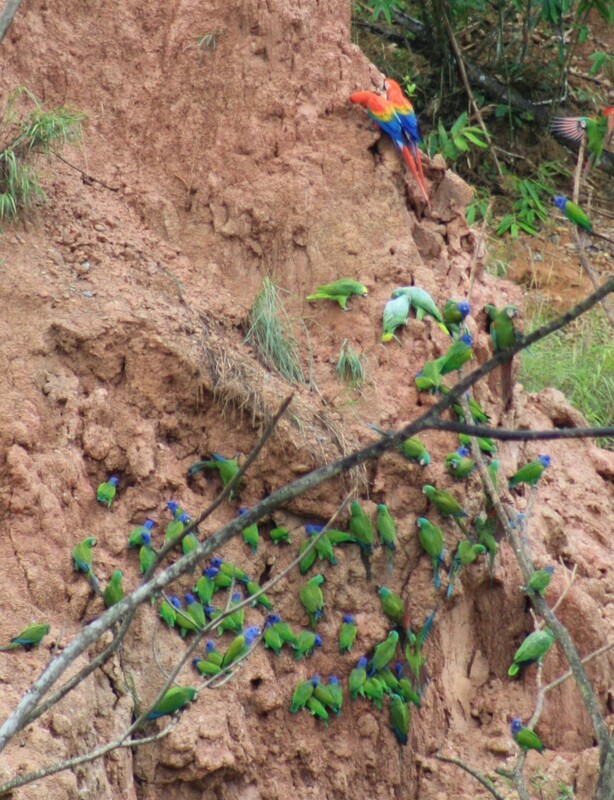 In spite of the efforts of environmentalists and health professionals, the mining continues. Why? Because gold costs more than $1100 per ounce. A miner working the rivers (with mercury and carpet and a barge) can make hundreds of dollars in a day. The average household income in Peru is hard to determine, but most of what I could find indicated that it was about $5000/year. 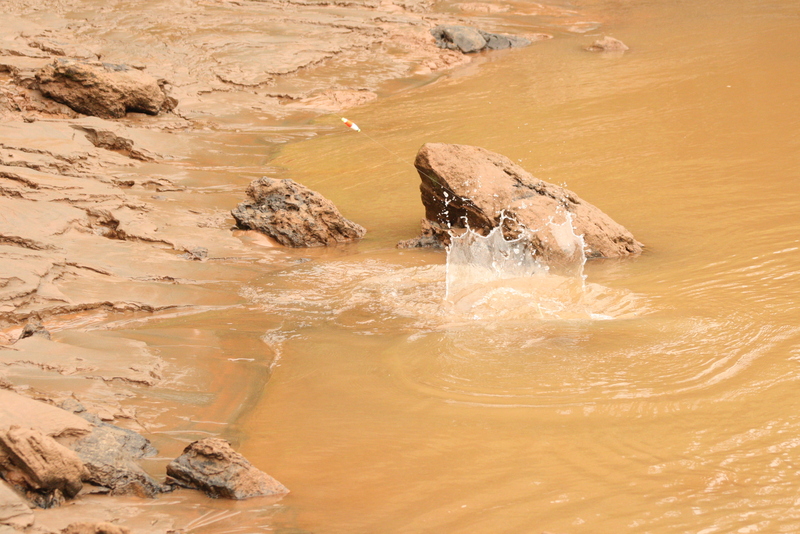 The rush for gold is killing the environment and endangering the humans…but we just can’t stop looking for it. I’m not bashing Peruvians here – I have increasingly understood in recent years how tempting it is to choose the evil that wants to destroy us. Heck, at least in Peru, it makes some sort of (short-term) economic sense: if I mine the alluvial gold today, my family can eat. I don’t, then we starve… But so often we see people choosing the evil that destroys them and it doesn’t seem to make sense at all…we nurture our hatreds, even when they rob us of joy. We cultivate our lusts, even when we know that they damage our sense of reality. We continue to give in to our addictions, even though they will kill us. Dostoyevsky has captured the human condition: we are in love with the powers that will destroy us. It may be hunger for power, or for money, or for ease or satisfaction…but each day, each of us must choose how we will relate to those devils that would crush us. Later in the book, Alyosha will demonstrate time and time again that it is within our power to choose to embrace the Holy and reject the profane…but those choices are often neither instinctual nor easy. We will not fear, for God hath willed his truth to triumph through us. 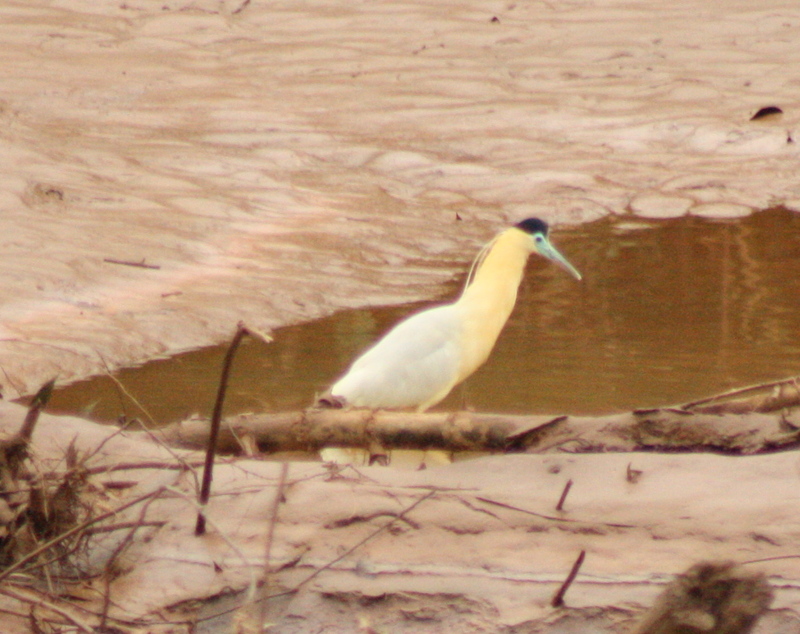 When we arrived in Puerto Maldonado, the Tambopata River was an angry brown slurry. Heavy rains upstream in recent days had caused a remarkable rise in the water level (I guess that part of the world is still on the Army Corps of Engineers “to do” list in terms of dams). In fact, a couple we met who was leaving the rain forest said that the river rose ten or twelve feet in just a few hours while they were there. Good to know. I’m all for that – bringing the latest in safety equipment onboard is something I support. But as the afternoon wore on, it became apparent that the young man, Pablo, was, well, apparently useless. He slumped in the front seat, or he chatted with Fino, or he looked around at the birds that we passed…the thing is, he did a lot of things – but communicating with the driver was apparently not one of them. We steamed along at a pretty good clip (I’m going to say that the canoe itself seemed to be about thirty feet long and had an 80 horsepower outboard engine on it). 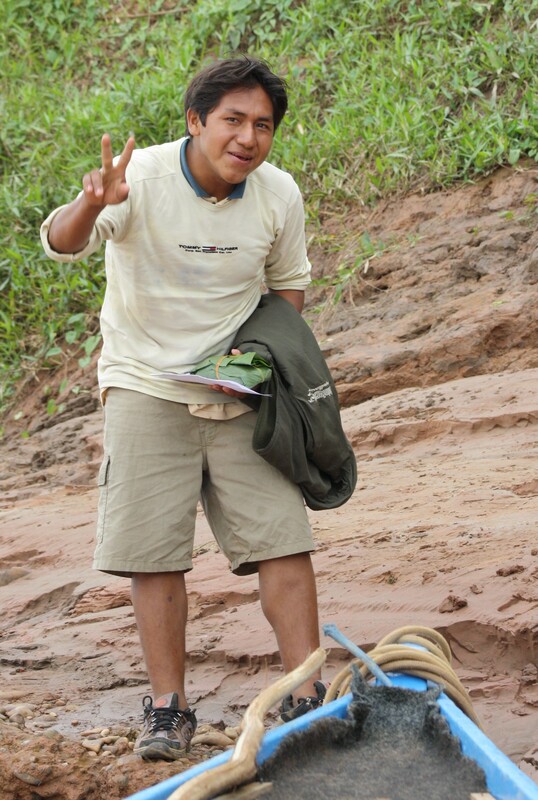 Four hours later, when we arrived at the Tambopata Research Center, Pablo did climb out and tie up the canoe. Sharon said to me, “What did we bring him along for? He didn’t do anything.” And she was correct. By and large, the week we were there was cold but dry. Each day, we noticed the level of the river dropped by about eight or ten inches. That means that when we headed back down the river, what had been a swollen torrent was now a rather sluggish, if steady, flow. And while the drive upstream had been a straight shot, the lower water levels revealed all sorts of sand bars and stumps sticking out of the water. Pablo spent well over half the trip standing on the bow of the canoe – sometimes he worked with an oar to bring us against the current; other times he used a long stick to check the depth of the water; and once or twice he stuck his feet out to kick us away from a pile of debris. In short, there was no way that we’d have made it back down the river without a second pair of eyes and hands in the front of the boat. That got me to thinking about the wisdom of José, our boat driver. While we really didn’t need Pablo at all on Saturday, by the time Wednesday rolled around, the river had dropped three feet and the entire landscape had changed. José was prepared for challenges that did not yet exist, and that made our ride better and safer. As I reflected on that, I wondered how much of that is true in my own life. To be sure, one can take this to extremes and worry about all sorts of details and pressures that may or may not ever occur, but on a basic level, is seems to me that a part of my Christian discipleship is preparing for the obstacles that I may very well encounter at some point in my journey, even if they are not currently a threat to me. I want to be the person who is able to, for instance, give money to someone who needs it. So I need to live on less than I earn and have a little on hand in case the opportunity presents itself to me. I want to be a person who is wise – and so I spend a little time each day in the company of authors and speakers who are models for me. 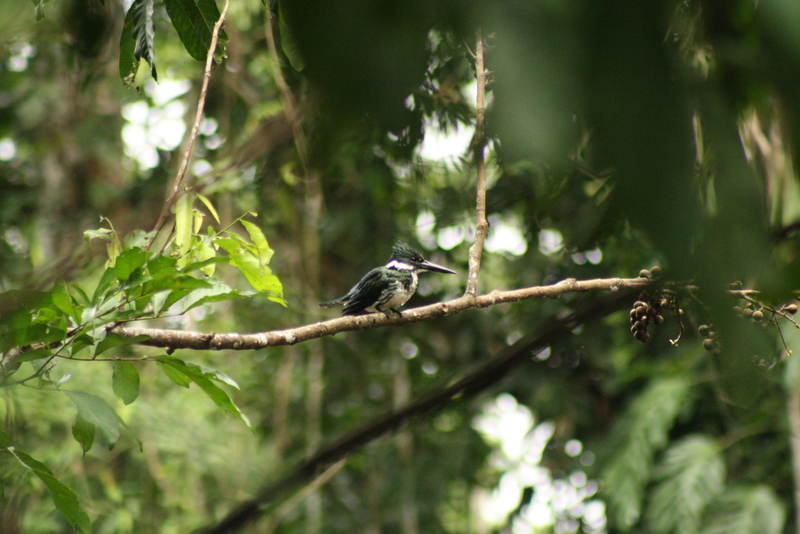 "I don't care if it rains or freezes..."
I hope I remember all sorts of things about this trip – the bird life, the fishing, the time we nearly froze to death in the rain forest…but I also hope to remember the lesson I learned from Pablo and José. I hope that I can be a person who is inwardly prepared for the things that the day might bring me…that I might have a reservoir of faith and hope that will allow me to steer clear of any snares or temptations that might threaten my voyage, or present an obstacle to someone with whom I share the journey. I am grateful for all those Pablos who have ridden with me so far, and hope that I can offer that to someone else in the days to come. 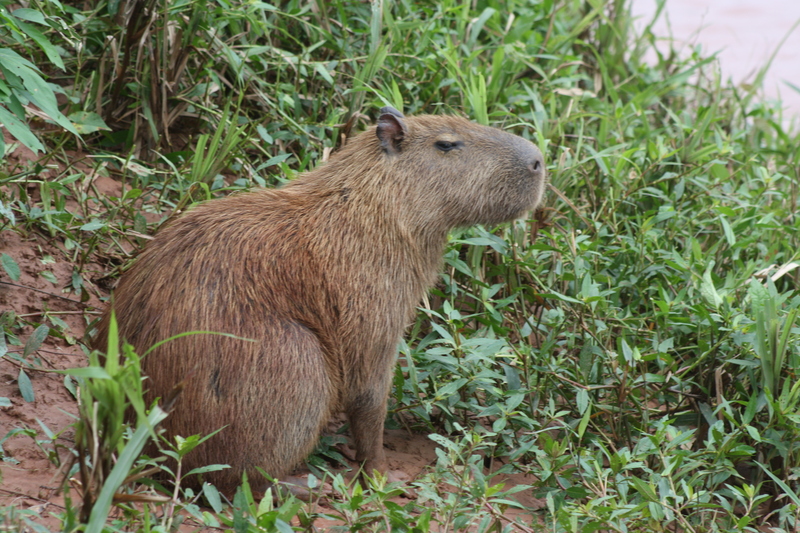 Capybara were a common sight on the river drives. I may have mentioned something in a previous post about fishing…well, to date in South America, we’ve had one round to the fish (in Chile) and another to me (in Peru). Needless to say, I was eager to break the tie! 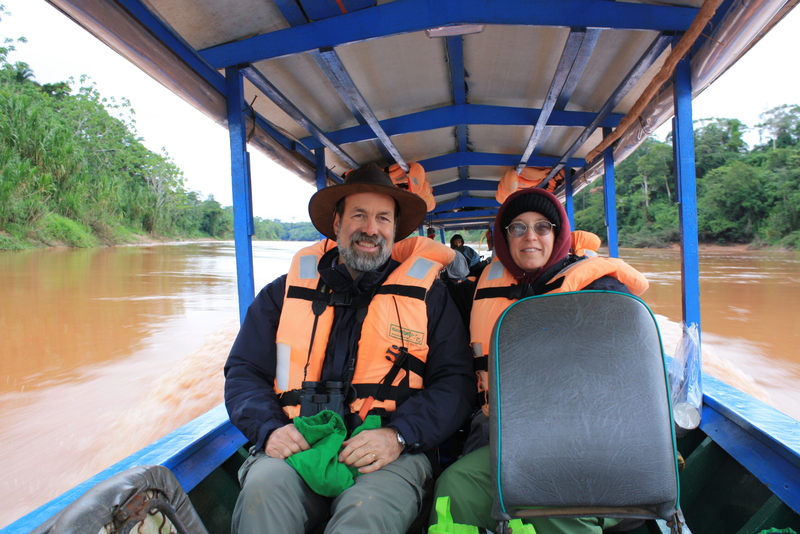 Wednesday, we took a motorized canoe from the Tambopatas National Reserve (river fishing prohibited) to the Refugio Amazonas (fishing permitted). When we got to the “port”, lo and behold, we had about 45 minutes before our next scheduled activity. I just happened to have my telescopic fishing rod handy. And my friend Fino, quickly becoming my very own Sancho Panza, just happened to have a piece of meat on hand. The ladies went up to the lodge, while we decided to wet a line and see if we could break a tie. I was using a piece of beef and about a #10 hook on 12 lb test, and I want to tell you, the reel just screamed! I had forgotten to bring wire leaders, so I was afraid that the fish might have teeth and bite through the line. But I had to play it, because it was really a fighter. Those readers who have been steelhead fishing will know what I mean. I fought the fish for about ten minutes. We had a battle back and forth, and unlike a steelie, this guy never jumped or showed himself. I had no idea what I was dealing with – only that my heart was racing and the adrenaline was really flowing. 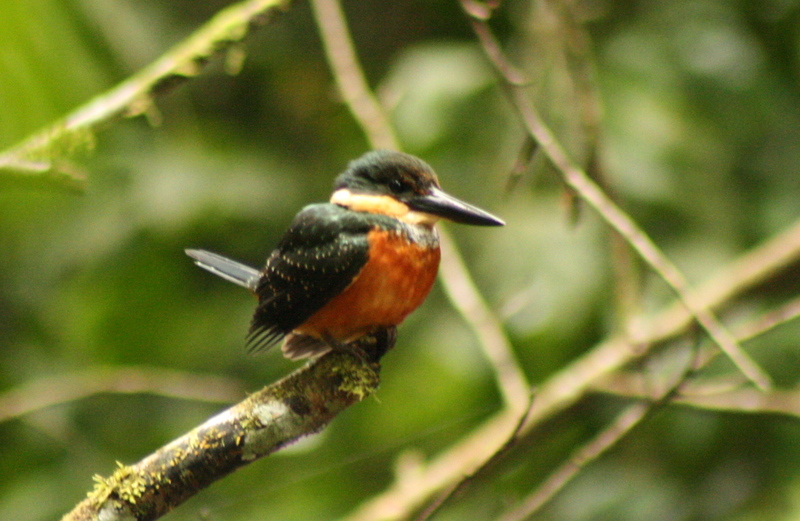 I couldn’t believe it – I was catching a decent fish (I hoped) in the rain forest! Finally, I landed him. This is a good picture, but it doesn’t do the fish justice. He was a real beauty! When we showed the photo around the lodge, the guides disagreed as to what to call it. Some said it was a Docella, while others called it a Mota. When I get decent internet, I’ll check it out. It is a catfish, of course – about three feet long, and weighing 5 or 6 pounds. It was an awesome feeling to bring him in, and then watch him swim away. After doing so, I said to Fino – I mean Sancho Panza – “Wow, now I am really disappointed that Sharon and Ariel didn´t come along. Well, they didn’t think I’d catch anything.” Sancho/Fino laughed and confessed, “Dave, I didn’t think you would catch anything either!” Of course that doubt didn’t stop him from taking my camera and showing the other guides what I had landed! Later on, I did bring in one more small fish – another variety of catfish called a Bagre that the locals eat pretty frequently. 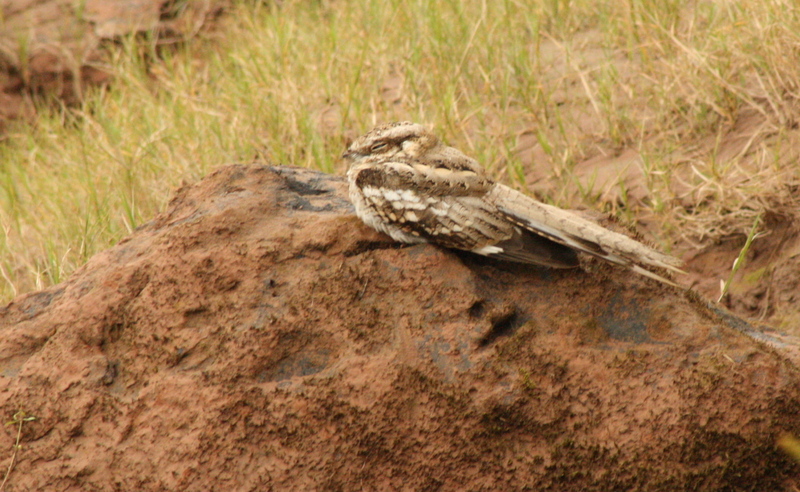 This one was only about 8 inches long. But it was a fish. And it was the jungle. The final fish of the trip...this trip, anyway! You know, just before catching the big fish, someone said to me, “Dave, that’s too bad that you didn’t get to fish more on this trip – the lodge screwed up when they promised you fishing time in the Reserve.” And yes, they did. 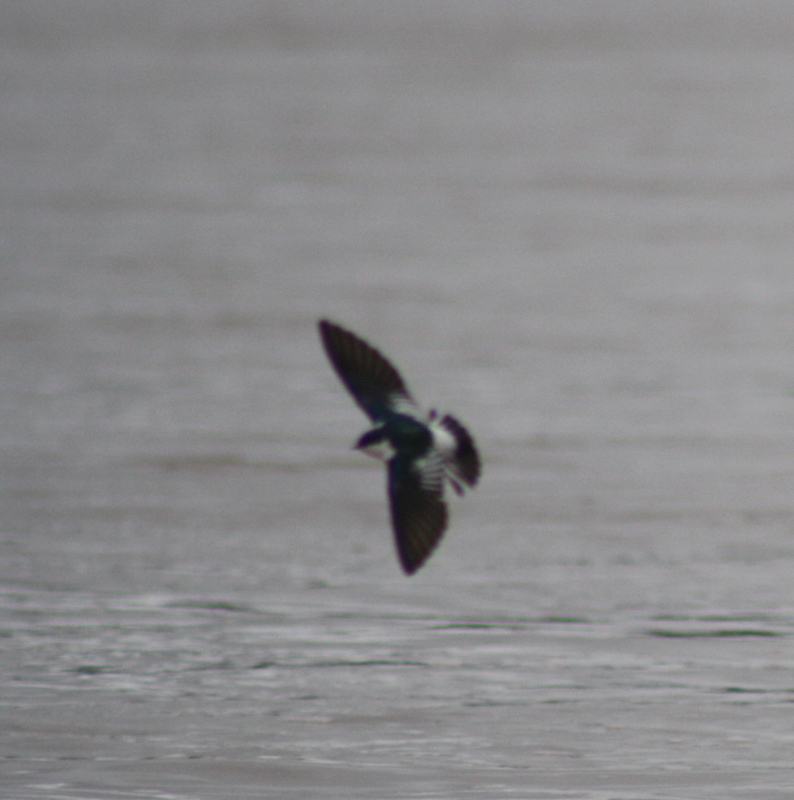 But here’s the deal: even if I hadn’t had the chance to fish after catching the first one, it would have been great. Because I didn’t come to fish. I came hoping to fish. And really, that’s what the trip is about: hoping. Waiting for a chance. Trying your luck. And maybe, just maybe, you get to bring one in. And sometimes, well, sometimes it works. Sometimes you bring in one that makes Sancho and the other guys smile. One that brings joy to your heart. And that one is worth a lot of time sitting watching, waiting, hoping, and praying. I hope you catch one today, my friend! Well, well, well… As the title of the blog indicates, my second attempt at practicing the piscine arts in the Southern Hemisphere met with a little more success than did my first. 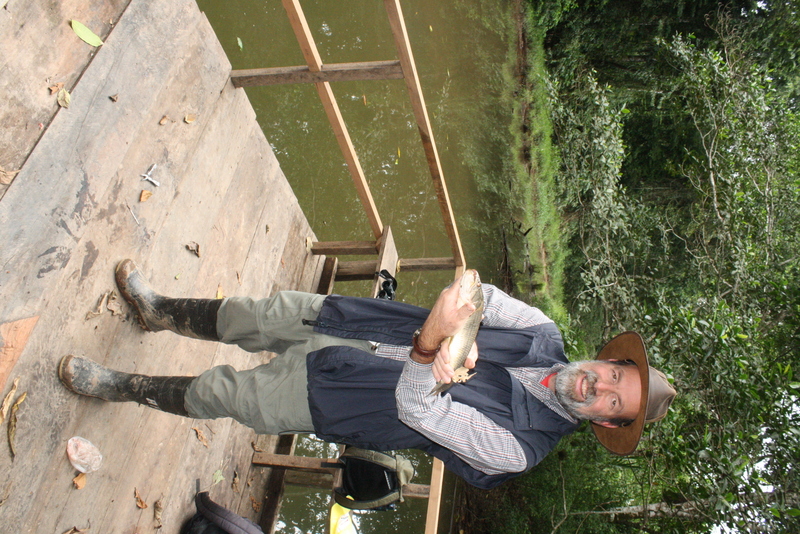 One of the reasons that I chose the adventure in the rain forest was that it promised a day of fishing. I assumed that meant that the guide would provide all the equipment, etc., but just in case, I packed my trusty telescopic rod and a few essentials. Good thing for me – because the local guide had no idea about any promises for fishing. 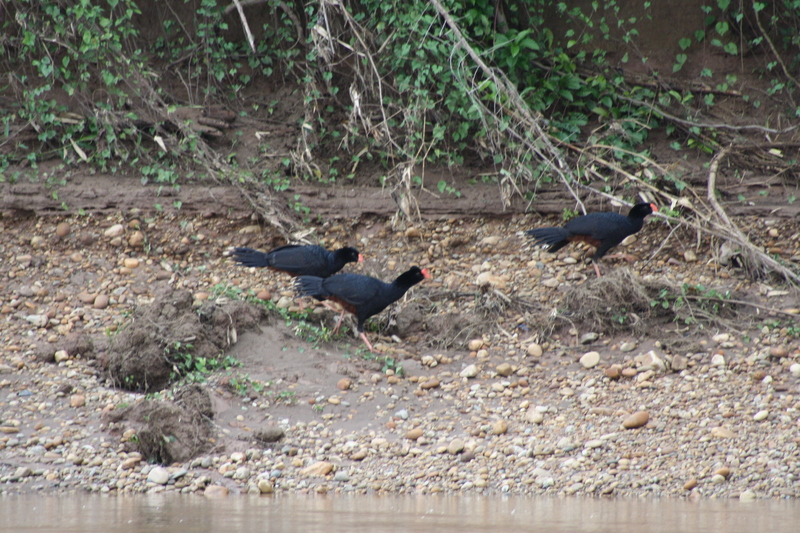 In fact, fishing on the Tambopatas River inside the Tambopatas Reserve is strictly forbidden. Dang! 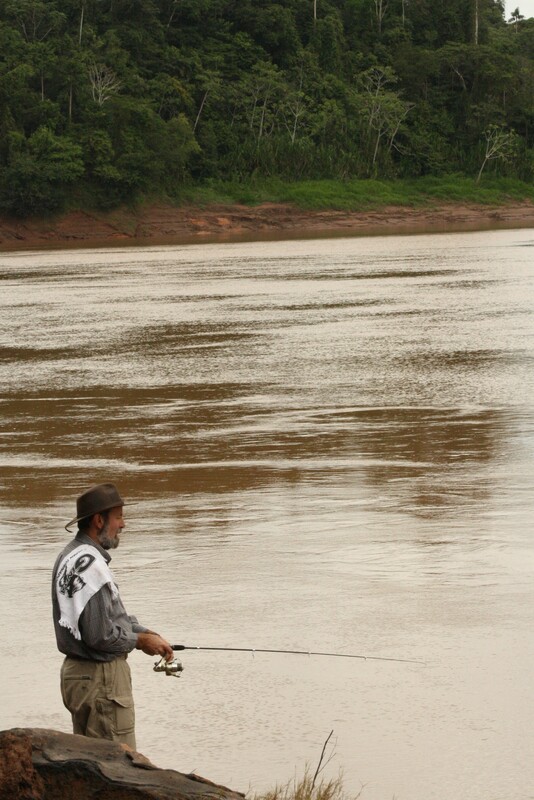 Yet our stalwart guide, Fino, a good natured, extremely knowledgeable, and good-humored Brazilian, was eager to see my dream of fishing in the jungle come to fruition. To that end, we wrangled a couple of hours on a small pond. Allow me to set the stage. First, there are my fishing companions. As I have mentioned, Fino was there. But I wasn´t the only fisherman there. 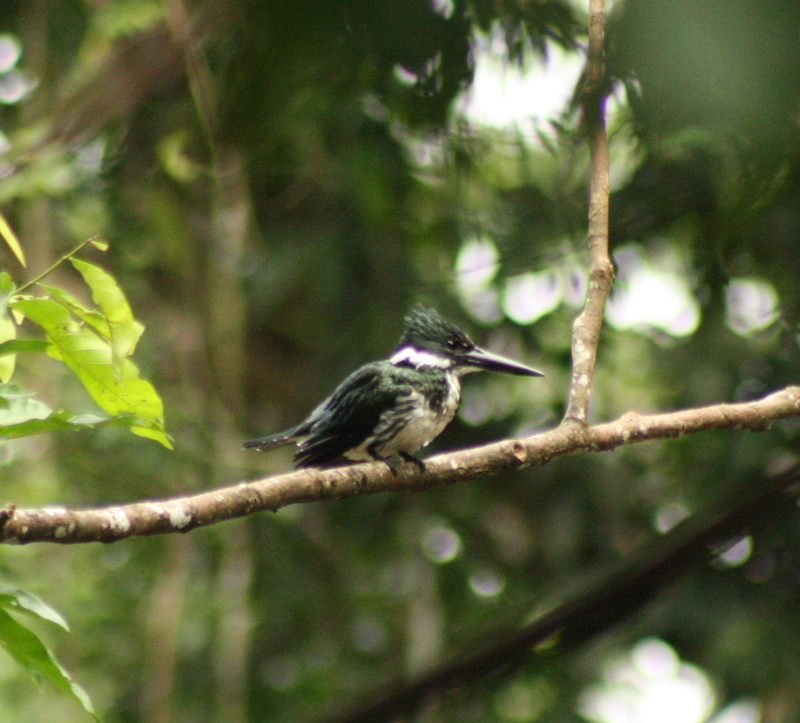 For instance, there was a beautiful Green and Rufous Kingfisher who, at first, was having a lot better luck than I was. 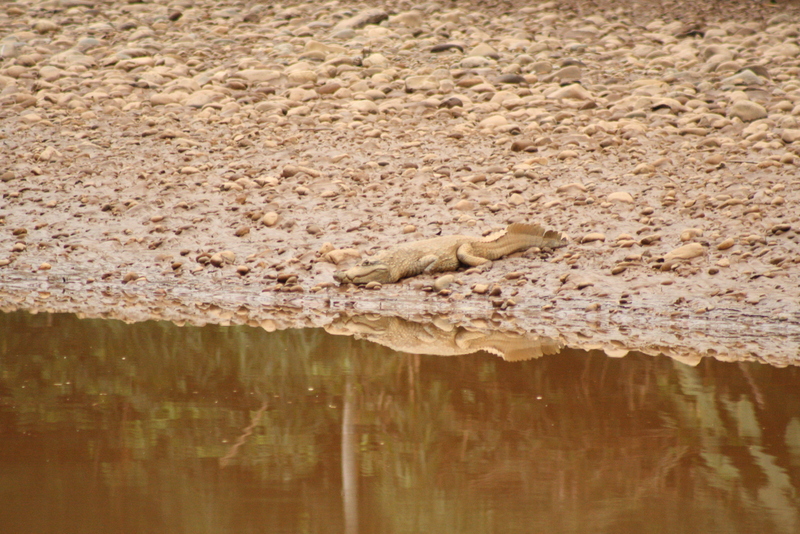 Not far away, a White Caiman watched with some interest. Later, in fact, he would profit from my extra bait. 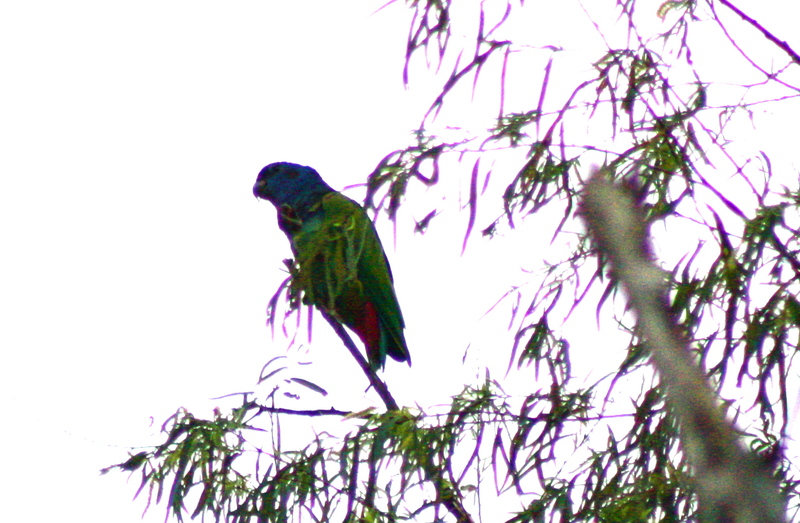 In the trees, a group of howler monkeys had better things to do than watch this gringo with the odd equipment. The competition for the fish was, shall we say, fierce! I put a fresh piece of meat on the hook, cast my line, and waited. After a few false alarms, there was nothing for twenty minutes. 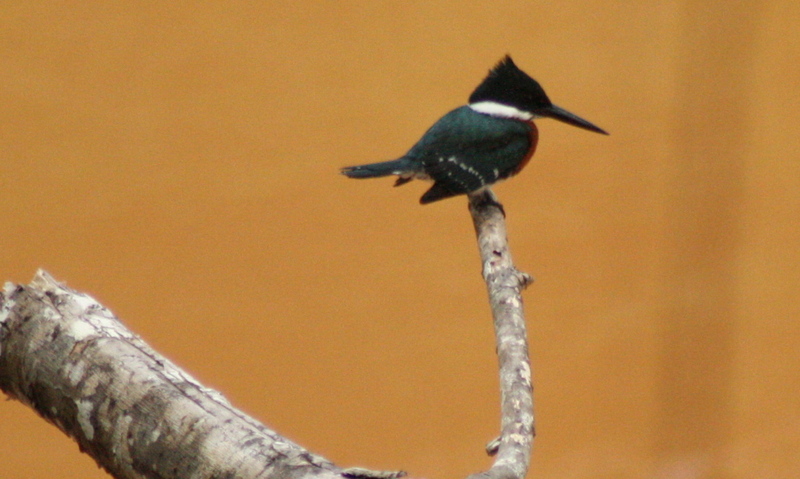 I wish I could say that I was paying total attention to my line and concentrating fully, but, well, you see, that Kingfisher was so beautiful, and I thought that I saw a few turtles, and there was an owl there, too…so I had my back turned. When I looked again, my pole was dancing…and then I started dancing. I reeled in my line, and then when I saw the fish, I called for Fino. 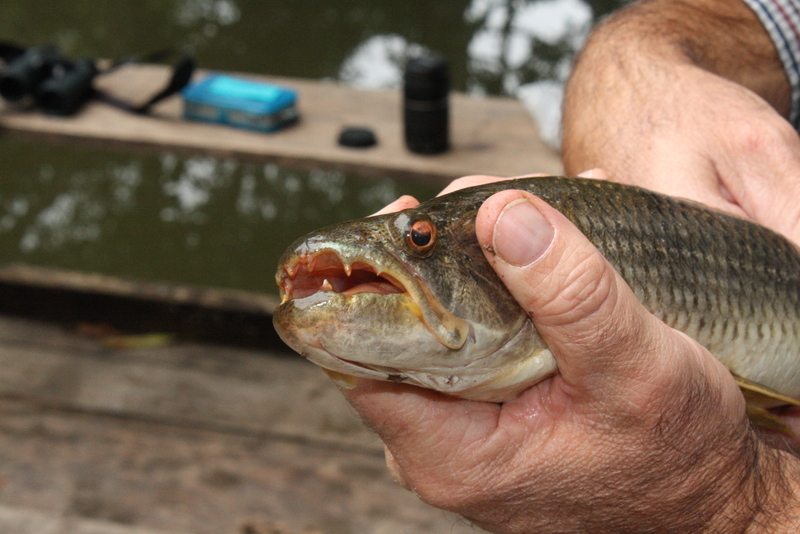 I am not used to fish with teeth! True, it’s not a giant fish, and true, it wasn’t the fight of a lifetime, but the thing was, I was fishing in the jungle…and I caught something! It was a thrill to me – and a surprise to Fino! After I released this giant back into his natural habitat, we headed back to the lodge for some well-deserved tea (and to show a few pictures!). Turns out that there were a few friends waiting for us there! After I released this giant back into his natural habitat, we headed back to the lodge for some well-deserved tea (and to show a few pictures!). Turns out that there were a few friends waiting for us there! 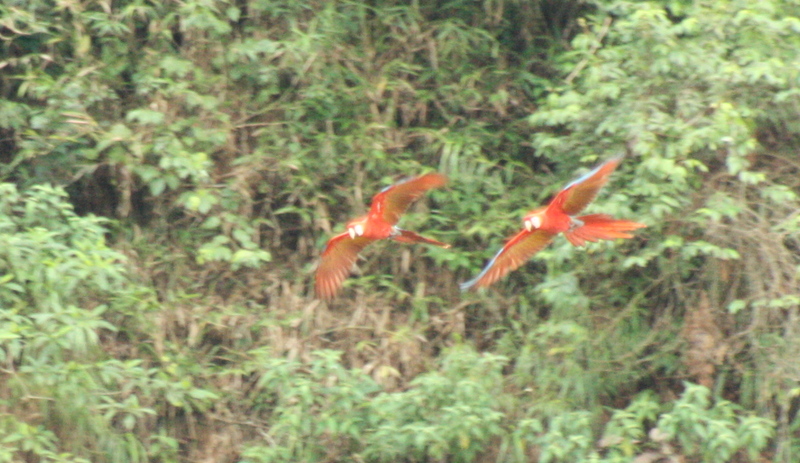 A few Scarlet Macaws have taken to visiting the Tambopatas Research Center, and they apparently like to get to know the guests. It was a treat to see these wonderful animals up close and personal. So I had achieved my dream to fish in the Amazonian jungle…but it was a tie – the fish and I had each pitched a shut-out once. Would there be another opportunity? 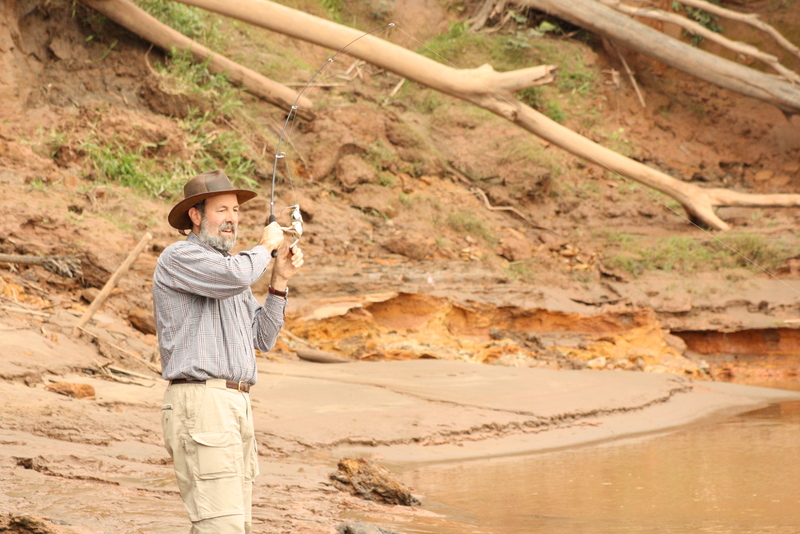 Or was I destined to fish like a world cup soccer game…long and ending in a tie? Tune in tomorrow for another update! Who Wants To Go To Peru? Well, our time in Chile has finished. 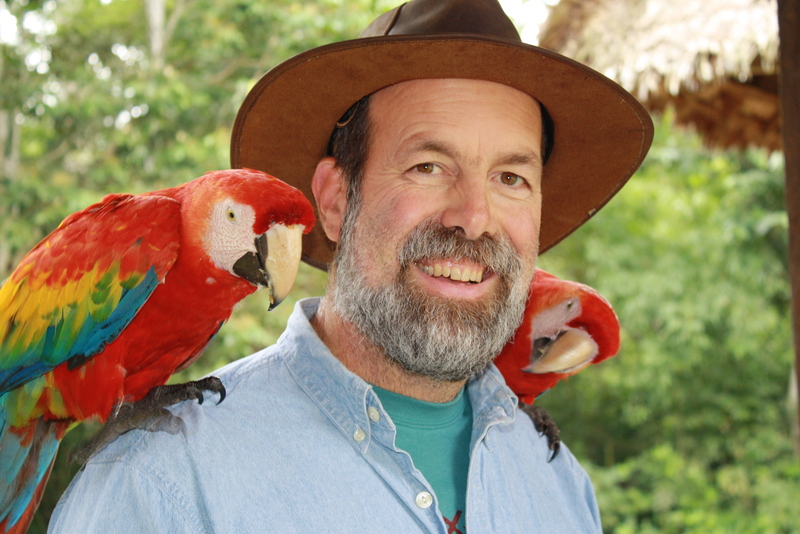 When we arrived, our hosts asked about the Sabbatical, and they were all thrilled with the concept…until we talked about the second leg of our South American journey – visiting the Amazon basin in Peru. They looked a bit incredulous, and then asked in all sincerity, why would anyone want to go to Peru when one could stay in Chile? That´s muy loco, my friend. Yet on we go. I´m not sure what kind of internet access we´ll have, but I want to give you the chance to get a glimpse of our itinerary. On Thursday, July 15 we flew from Santiago Chile to Lima, Peru. We planned to spend the night at a shady little hotel near the airport, and then first thing Friday morning, we´ll fly to Cuzco. 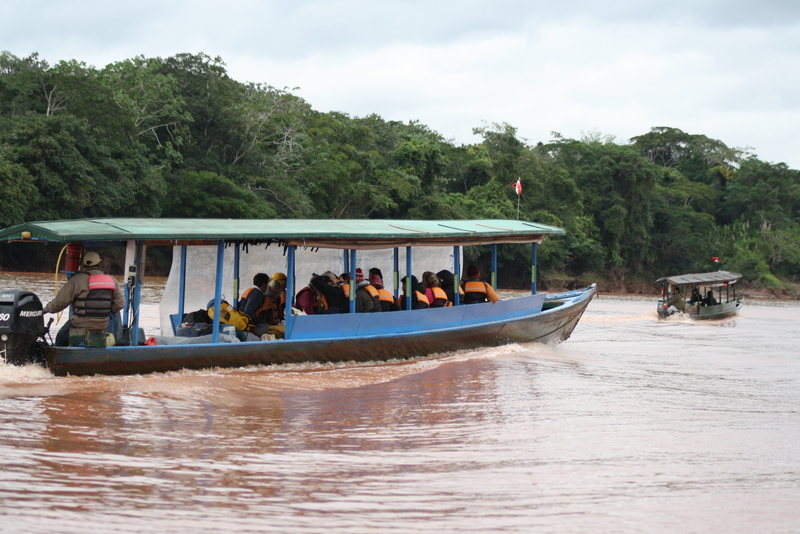 From there, we´ll hop northeast to Puerto Maldonado, and begin our Amazon adventure. 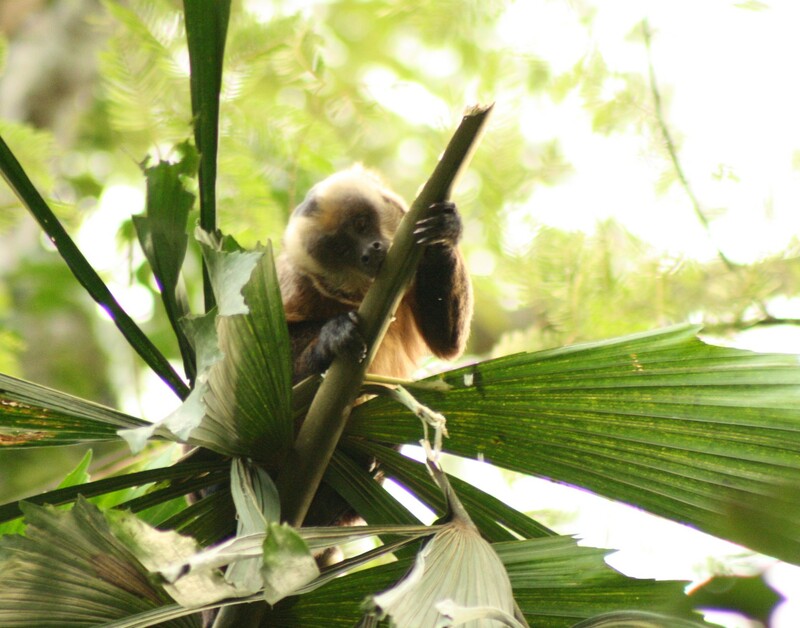 For a day-by-day, detailed agenda for this trip, check out Trip Notes for Refugio Amazonas Lodge and Tambopatas Research Centre in Peru. While our time in Chile was full of travel and experiences with friends, this leg of the journey promises to give us plenty of time for wondering and wandering in a relatively small geographic area. 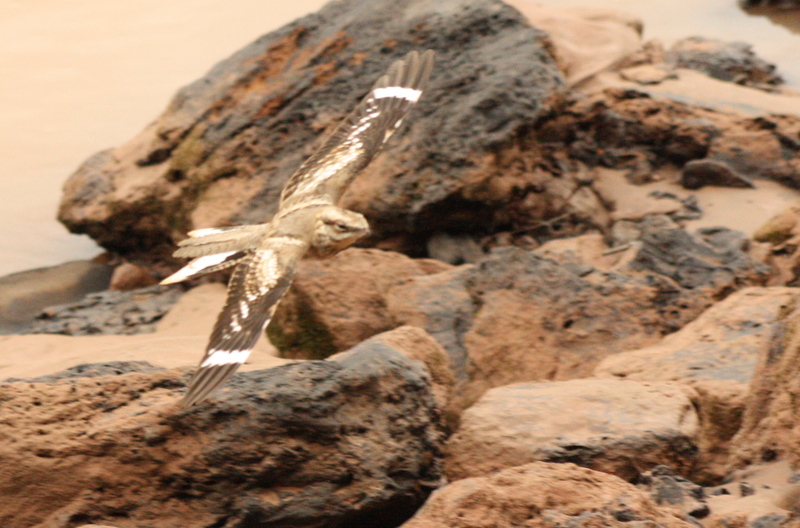 On Thursday, the 23rd of July, we´ll return from the Research Centre to Puerto Maldonado, and then back to Cuzco. We´ll stay for a day in this town getting used to the altitude and then board the train for Machu Picchu. You can read more about this amazing place at Wikipedia´s entry on Machu Picchu. We leave Cuzco and Peru on Sunday the 25th and return to Washington DC on the morning of the 26th, and from thence we drive to Pittsburgh in time for dinner (we hope). It may very well be that we´ll have an internet connection along the way, or it may be that you´ll be getting a well-deserved break from my writing. At any rate, we´ll appreciate it if you keep us in your prayers.